No eye has seen any God besides you, who acts on behalf of those who wait for him. No single day has passed since Lola’s sickness and eventual death that I did not think about and replay the things that happened to her. I last saw her in Bataan February 18, 5 days after her birthday. I was attending and speaking at the Philippine Rheumatology Association Annual convention, so I missed her birthday celebration on the 13th. Lola, 95 by then, ripe in both age and wisdom, has mellowed through the years. Had I missed that day back when she was in her 70s or early 80s, she would probably have been a bit more emotional. And as everyone close to her would probably agree, maramdamin is Lola. But on the 18th, she was different. She was relaxed, and was just plain happy to see me and my wife Hannah. She smiled more that day, as I vividly remember, as we talked about plans on going to Tibagen at around this time of this year. Lola was very talkative and kept on reminding me to create space in my schedule so we can go there – kasi matutuwa silang lahat na makita kami doon. I told her, mas matutuwa ako na makikita nila ulit si Lola dun. You see, at that time, she just suffered a near fatal heart attack which she amazingly survived. Fighter talaga is Lola. Any other 95 year old would probably not have made it through that heart attack. By God’s grace, she did. Around mid-March, I received news that lola had abnormal uterine bleeding. Parang nagreregla ulit, pero mas mahina lang. She was initially seen by a doctor who did some tests and said there was nothing to worry about. But the problem persisted and we felt something was amiss, so I asked the family if she can be brought over so I can ask some colleagues to take a look at her. Of course, as expected, ayaw ni Lola. “Wala naman ako sakit, gagastos pa kayo” she would always say. But we were able to convince her, and she made that long and tiring trip to La Union. Little did I know then that that trip would be her last as a “healthy” person. She was found to have Endometrial Adenocarcinoma or cancer of the uterus. Bearing 6 children and growing old to be 95 probably took a toll on her body. We were given the options of treatment – surgery or radiation. We weighed risks and benefits. We took the surgical option, and for several days after the operation, Lola was okay, except for the occasional pain and discomfort from the wound. However, several days later, she complained of abdominal and chest pain and there was a bulge in her puson. She got readmitted and was found to have wound dehiscence – the sutures gave way and the wound reopened. We found out she had some infection inside her body that caused the wound to open. She had another surgery to fix that, but it took quite a toll on her 95 yo body, and she had mounting complications by the day. She developed pneumonia. She got better in between, as for she was greatly responsive to treatment. Di naman kasi nagkasakit si Lola ever, except for the Total Hip Replacement back in 2012 – she was relatively well. But every time we dealt with one problem, another one arose in it’s place. 6 days before she passed, she was even in a video listening to her daughters sing to her and playfully answering their questions about their birthdays. She seemed strong then, but only a few days later, she wouldn’t eat well and that was the start of all the new problems that eventually caused her to weaken and weaken and weaken. She had a cardiac arrest at one point but we were able to revive her, and she even awoke for a brief period, opening her eyes when spoken too, and shedding tears every time we said our goodbyes while telling her that we loved her. And because it seemed that she would no longer get better from there, we decided to finally honor her request to come home. Initially, I was so against it, because I felt that she wouldn’t make it during the long travel back to Bataan. But the grace and mercy and love of Jesus is greater than medical science, and He brought Lola back home – very much alive. In fact, when she got back at the hospital here, she, who already was not responding back in La Union, began to have some spontaneous breathing and movements. She was no longer having any urine output then but when she arrived, she was able to have some. 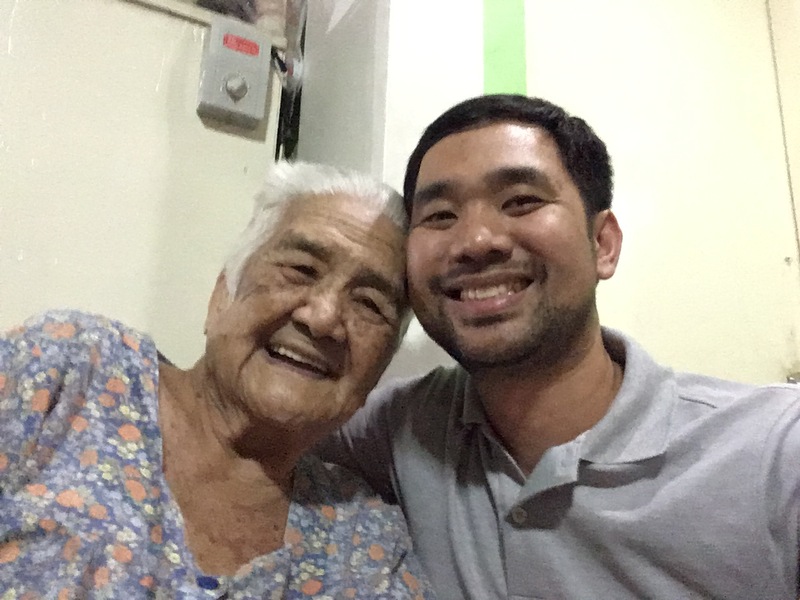 Lola is a survivor and a fighter talaga – and she fought through pain and death, by God’s grace – so she could come home and be with friends and family. But as always, with eventuality, death always wins here, and Lola passed on May 12, 2018, at 1:40PM. She was surrounded by family who loved her deeply. I was told that a minute before she passed, she opened her eyes and gazed around the room, looking at everyone there – and then breathed her last. To the very end, she was a miracle of and from God. To reach that far in her treatment, despite all the pain, suffering and repeated complications – that was the hand of God. Our failures as doctors is God’s triumph as God always has a way if making beautiful things out of our garbage. And because it is God’s triumph – it is Lola’s triumph as well. Let me explain the revelation that was given to me. God never wastes our suffering. And a life that is aligned with His will will also never end in waste. I prayed hard for Lola to get well when she was at the hospital. Everytime she showed progress, I thanked God. When she regressed, I asked and prayed more. But her sickness still prevailed and she still died. But Jesus made me realize – that if we pray and the answer we desire doesn’t come – even that can be a good thing. Sometimes, our requests are never realized because in His wisdom He knows it is not for our good. God either gives us what we ask for or what we should have asked. God can be trusted in His timing and wisdom. Lola could have survived this illness and lived a hundred years, but God chose to call her home at 95. And by calling her, He accomplished one perfect purpose. Lola’s sickness and eventual death seemed to be her last act of service to her family and I don’t mean that in a bad way. You see, we live far away from each other, and like every other family – we have some cracks and brokenness in our relationships. When Lola got sick – everyone forgot the differences and went home and became reunited and healed. Jesus, through Lola – made this possible. Lola’s death exults Jesus more than anything. She could just have slept her way to heaven, or passed all so suddenly another way, but she went through something as difficult and painful, yet as peaceful in the end – so God could all bring us all back together. Lola taught me a lot of lessons about life. But it was in her sickness and death that I learned some of the greatest lessons I have ever learned as a person and as a professional. I learned these, this time as an observer from the patient perspective. I learned that going the extra mile for patients meant a lot for them and the family. I’ve learned how to and how not to care for future patients and more importantly, how to comfort, when comfort is the only thing left a doctor can offer. I realized that, oftentimes, more than skill and intellect – it is the comforting presence of the attending – that is truly seared into relatives and patients, even when all is lost. Absence can sometimes be more painful than error, and the availability of a doctor to walk the family through all the things that are happening is oftentimes better than the medicine he or she gives. As doctors, just because something can be done doesn’t mean it always has to be done. Sometimes the best treatment is to do nothing except to comfort and be there. So thank you for all these, Lola. Death may seem to have won for now, but Jesus swallowed up Death in victory on the cross. Because of that, it is only a little while before we all see you again. It is but the blink of an eye in the light of eternity. You have lived an abundant and blessed life, up to the very end. Rest now, in the comfort of Jesus, in whom you have anchored your enormous faith. I am sorry for whatever way I have hurt and failed you – may God make all things right and beautiful… Goodbye Lola. I love you. We love you. The Lord has given. The Lord has taken. Blessed be the name of the Lord.